Radiating outside the human body is the aura. This auric field is an energy field, made up of several layers of energy comprising the mental, emotional, and spiritual `bodies' and the inter-relating `spaces' between. Universal life-force energy is drawn into the body through seven main chakras. This life-force energy is drawn in to adjacent nerves, glands, and organs via each chakra, to `nourish' and sustain the physical being. It is also vital to the auric field. 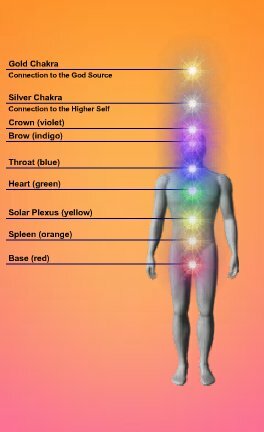 Sometimes these chakras are referred to as `spinning' energy centers. As a person mentally generates light from within, expanding it outwards and extending it in all directions, he or she is giving it intent to embrace or encompass the physical body and all seven inner layers or energy bands of the aura, filling them with light.